After few unsuccessful diets, I finally found the thin line between eating a full serving and one serving. Eating healthy is super difficult especially if there's always a 2 for 1 promotion on your favorite fast food/restaurant plus Uber Eats is just one click away. So when a PR Agency who handles Right Bite emailed me about the meal plan, I knew I had to do it; not just to try it out but to really know what my body needs. We're not getting any younger here so health is definitely wealth! First things first, body analysis. I was scheduled to do a body analysis with my dietitian Maria. She measured my weight, height, mass, fats, muscles, and metabolism. I would show you the analysis paper but the bottom line is I gotta lose 8KG. Sounds easy right? nope. So they agreed to put me on a Low Carb Diet Program; designed for healthy weight loss and builds on the foundation of a renewed body, but swapping the regular dinner with a lower carb option and boosting your protein intake. It also means that a full serving is not one serving. There is a certain portion in your full serving that is equivalent to a low-carb diet. 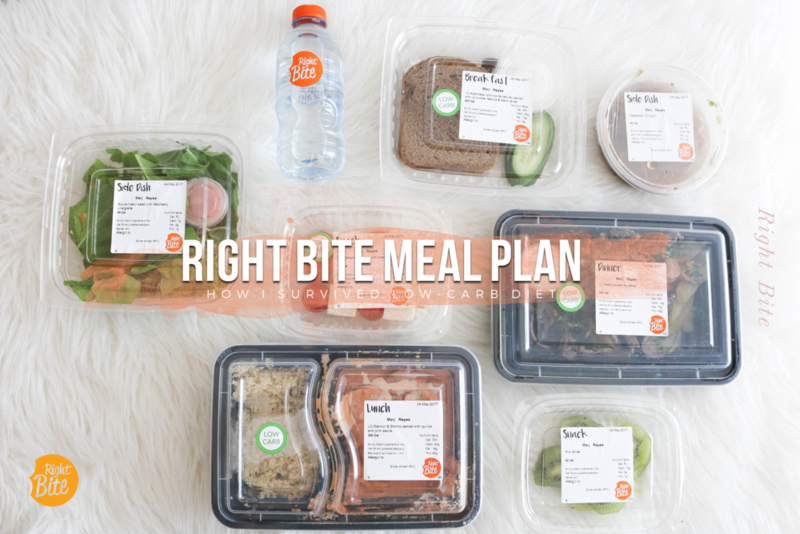 It's a One-week full package meal delivery with breakfast, lunch, dinner, and snacks. If you watched my instastories last week, I uploaded my daily meal from Day 1 to 7. They say the beginnings are always the hardest. That's proven and tested! I was struggling to drink the kick booster and eat the breakfast menu. In my mind, it was either a sumptuous breakfast or no breakfast at all. I did push through till the end of the day and actually managed to eat everything without cheating. 😭 I'd say that's an achievement right there. During the first day, the food wasn't very appealing to me. I'm not used to eating low-carb food but I convinced myself that I can do it! Day 4: I had to skip my dinner but I made sure I ate the right kind of food. My body already adapted the taste of the food and it actually felt like I've been doing low-carb diet for a long time treadmill 35 mins / 142calories - Asana Rebel Yoga 15 mins - 1 round of 7 minutes in hell CARROT workout. Day 5: I had more stamina than ever and I was actually motivated to go the gym because my body felt lighter. I was able to resist Mcdonalds and Pizza Company! 😭 I couldn't believe it myself. haha! That means there's progress! I don't know but the food seemed to be getting yummier and yummier as days passed by. 😌 treadmill 20 mins / 100 calories - Asana Rebel Yoga 30 mins - 1 round of 7 minutes in hell CARROT workout. Day 6: I cheated a little bit. 🙈 My workmate gave me Green Tea and I couldn't resist. Hahaha! Weakness. 🍵 no workout Day 7: My last day with Right Bite. ☹️ I remember the first day when I told myself that I wanna get over with it already but 7 days of doing the routine made me love it. One thing I realized, I always have a choice to eat healthily. At first, it felt compulsory but after some time, I was already willing. Asana Rebel Yoga 30 mins - 2 rounds of 7 minutes in hell CARROT workout. Rightbite provides everything from breakfast to dinner so your 24 hours is basically planned already. Your part is to have a balanced lifestyle. Question is, will I do it again? I sure would. The thing is, I actually have time to prepare my food and I'm just always being lazy. So part of choosing a healthy lifestyle means starting my day early and preparing my meal. I would take this opportunity to apply everything I learned from Right Bite! So what are you waiting for? visit www.rightbite.com now to book your appointment and start a healthy life! I would like to hear your thoughts. How do you keep a healthy lifestyle? I hope you guys liked this post and do share your healthy stories with me. Let us motivate each other!